But can I be totally honest with you? If you have the presumption that all these benefits will start flowing in as soon as you roll out your B2B ecommerce site, you are sadly mistaken. There are many steps in between deciding to take your wholesale business online and its eventual popularity. Wouldn’t it be great if you knew the exact steps to success? Alas! There is no written rule for success. Your website leaves an indelible first impression on your buyers. If you are among those who think that a B2B ecommerce site need not be as jazzy as the B2C site you are making a huge mistake. The UI/UX of a business to business site is as important as any B2C site as the users are accustomed to the ease of use offered by the latter. With more and more buyers using their smartphones for initiating a product search, you need to be really careful about the design, layout and speed of your site on multiple devices, primarily the mobile. Also, to engage the visitors the site should have an aesthetic and mobile-optimized design. You should also offer easy navigation and hierarchical product categories so your customers do not face any difficulty in searching their desired products or services on your B2B ecommerce site. The SEO elements like meta title and description on your pages should be well in place so your site ranks high on SERPs. These measures will improve the accessibility of your website and ensure you get a higher traffic volume. To ensure that you do not miss on any of these points, StoreHippo brings for you a comprehensive set of business to business features. It incorporates exclusive features like a multi-seller marketplace, multi-store, multilingual site, pricing overrides, bulk order processing, custom ricing and much more to make your B2B ecommerce processes faster and smarter. Do you know that 74% of B2B buyers find it easier to buy online from a website? Add to this the fact that 93% buyers of this category research, finalise products and then buy online. The writing on the wall clearly says that you have to take all your products and services online to get better sales. We also know that online buyers get distracted very easily and might abandon your cart if they do not find relevant product details on your site. If your site fails to capitalize on good product images and description you are going to lose the battle even before it began. Be sure to add customer friendly product images, descriptions, product details and any other relevant information when you opt for B2B ecommerce solutions for your wholesale business. Providing detailed product information not only engages your customers but also saves valuable time on support queries. Adding FAQ on your product pages along with other details can even improve your conversion rate. Other important details to consider are product variants(color, size etc), weight (if applicable), model number, ISBN (books) or any similar details that help your customers in making instant purchase decisions. StoreHippo takes care of all these factors and allows you to present a 360- degree view of your products and services. With features like product variant, FAQ for each product, adding custom fields for product description or customer query etc. These features fast-track your conversion cycle and help in keeping the clients loyal to your brand. It is well accepted and common knowledge that no two customers are same in a business to business environment. Hence it is imperative to have B2B ecommerce solutions that offer the provision for offering differential pricing to each of its customers based on the ticket size, customer loyalty or even the product or service in demand. If your business does not offer this provision it is bound to lose its customers eventually who would negotiate better prices based on their relationships with other brands. Hence you should opt for an ecommerce platform that allows you to customize your pricing based on the customer’s unique relationship with your brand. Features like login based pricing override or organizing customers in groups so that you can offer them IP based prices go offer an easy mechanism to offer different prices to different customer segments. StoreHippo has many features that enable you to offer custom pricing on your B2B ecommerce website. Features like pricing overrides, login-based pricing, wholesale and retail pricing and pricing comparison help not only in offering custom pricing but also allows the client to take an informed decision. Business to business deals are a lot more complex than a simple B2C purchase. Also, the customers are spread more widely across diverse geographical and political regions making it necessary to have an extensive range of payment options suitable for different user groups. In a B2B ecommerce environment simply offering some payment gateways do not work. Such a setup needs a host of national and international payment channels along with, adaptive payments, automatic reconciliations, location-based gateways, support for loyalty based wallets, multi-currency payment options and customized checkout options should be there. The whole purpose of offering these many choices to customers is to allow them to use the most viable payment channel as per their requirements. When they are saved from the hassle of paying additional taxes or conversion rate charges due to the flexible payment options offered on your site they remain loyal and keep placing repeat orders. StoreHippo offers all the above-mentioned payment options through its B2B ecommerce solutions. Using these you can meet the expectations of your clients and offer them a seamless shopping experience. B2C ecommerce has changed the way we used to perceive businesses. With exposure to various B2C features that make shopping easier and fun, B2B customers are also conditioned to expect similar features and ease of use. Up to 80% users of a business to business site compare their experiences with a B2C site and accordingly rate a new B2B site. For a successful B2B business you need to have a host of features that have made online shopping a hobby for the buyers. Features like a seamless mobile-ready site, easy search and navigation, hierarchical categories, simple sales process, personalized deals using real-time offers and a streamlined delivery channel not only keeps your B2B ecommerce buyers happy but also keeps them loyal for your brand. These features make a site stickier and help the clients search for products or services on their mobile devices from anywhere anytime. Naturally then, these features help in boosting conversions and shorten the sales cycle. StoreHippo offers a host of B2C capabilities including a beautiful device optimised site design, push notifications for personalized deals, a powerful discount engine, faceted search, multi-tier categories etc. to offer the most simple yet engaging buying experience to your buyers. Online B2B sales are growing every year. A business that is growing and changing rapidly needs a flexible B2B ecommerce platform that is ready to adapt to the new requirements of the business. Also, it should be designed in a way that it easily allows for third-party integrations that are an integral part of your day to day business. Third party integrations like live chat support, mailing software, ticketing software, various payment and shipping channels, social media integrations and other APIs that may be required for smooth functioning of the B2b business should be easy to integrate and use. A rigid ecommerce platform that requires too much effort to integrate various third-party services can limit the functionalities of your business. Also, it can make the overall business processes complex and more time and resource consuming. StoreHippo B2B ecommerce platform allows easy third-party integrations that are needed for any business. All the above mentioned third party services and components can be easily integrated with your B2B website powered by StoreHippo. Business to business clients are accustomed to having a single point of contact that works as their personal manager with your brand. Since a lot of steps are involved in a B2B deal it is imperative that confusion or gaps are eliminated by keeping the dialogues focussed through a proper channel. Also, as many teams are involved in making the final purchase decision, there should be a support person or manager who has a clear understanding about the whole process and who can answer the queries of the client who intends to close a deal. If your B2B ecommerce solution does not offer a strong support through various channels like live chat support, email engagements, call support etc. it would become difficult to retain customers who are accustomed to having a point of contact. StoreHippo allows you to integrate all these support channels with your website so you can give a multi-channel support to your clients. Business-to-business ecommerce is a huge opportunity and it can prime a wholesale business for stupendous growth and new opportunities. 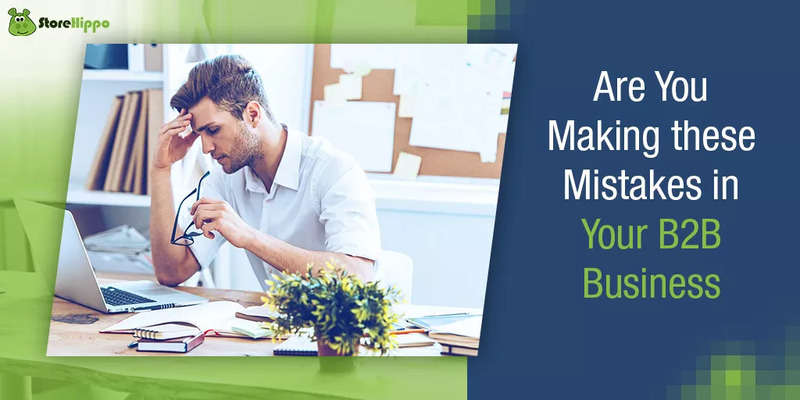 However, as a business owner, you need to be careful about the above-mentioned mistakes and ensure that you choose a comprehensive and flexible B2B ecommerce platform that allows you to incorporate various changes easily. Have suggestions or queries about a B2B website? Post them in the comments below and Storehippo team will get back to you with a solution.